Product prices and availability are accurate as of 2019-04-12 21:57:29 EDT and are subject to change. Any price and availability information displayed on http://www.amazon.com/ at the time of purchase will apply to the purchase of this product. PALETTE - Sturdier than disposable paint trays, these easy-to-clean, palette-shaped plastic trays can be used again and again. Individual trays measure 8¾" × 6¾" (22 cm × 17 cm). Each has 10 paint wells and an easy-grip thumb hole. Water Cup - This easy-to-clean, pie-pan shaped cup has brush rests. It's great for mixing tempera. It measures 3-1/2" in diameter and 1-1/8" in depth. 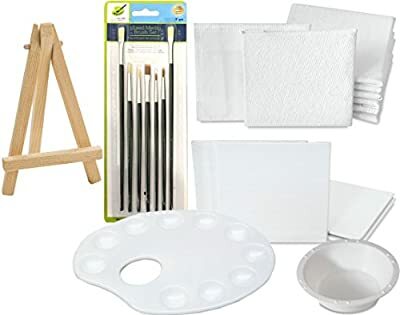 Studio Mini Canvas Panels are well made and economical - perfect for quick studies, miniatures, multiples, crafts, and gifts. These panels feature 3 oz cotton canvas firmly glued to a 1/8" backing. Pre-primed with acrylic gesso in your choice of White or Black, they are ready to be embellished with oils, acrylics, tempera, or collage materials. Studio Mini Canvas Panels are archival and acid-free, ensuring the greatest longevity for your smallest creations. 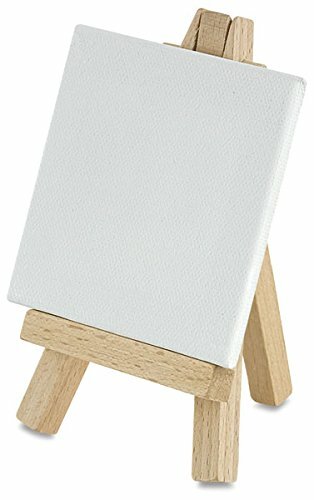 3 MINI EASELS - This 3" × 5" (8 cm × 13 cm) wooden mini easel is perfect for holding mini canvas, panels, Artist Trading Cards, or any tiny item for display.